In a paper first published in Nature.com, the authors discuss an interesting applied technology use case, using both drone data collection and AI to allow for the more frequent and accurate detection of specific individual animals or species of animals. The use case is for koalas, which in addition to being cute and cuddly are shy creatures. Koalas reside in forests with varying density, and are of interest to researchers. Prior to the current method described, teams of observers would go into areas to observe the number and density of koalas via physical inspection – just looking for them. The study finds that even experienced observers are only likely to find 70% of the koalas present in a given area; less experienced observers are only able to locate 23% of the koalas in a given area. This makes sense: many koalas look alike. Also being relatively small, koalas are easy to miss; so the accurate data collection is more suspect. This issue has varying importance given the size and the area covered (think elephants or giraffes, which are easier to locate given their larger size, but may be in more remote areas further from where humans reside and therefore less accessible). Now, drones equipped with thermal imaging can find the koalas – and AI can identify the specific animal, to avoid counting it twice and provide greater insight into behavior and health. The data collection is something that we are used to seeing with drones, but the combination of AI is interesting in this application. Interpreting the data manually is tedious and time-consuming, as well as error prone. A commercial application such as reviewing aerial photography from a drone for a long pipeline inspection is very analogous, or even CCTV camera’s looking for bad guys: looking at large amounts of video data is difficult, boring, and prone to errors. It seems, however, that koalas have individual heat signatures. That allows scientists to identify individual animals with some confidence. 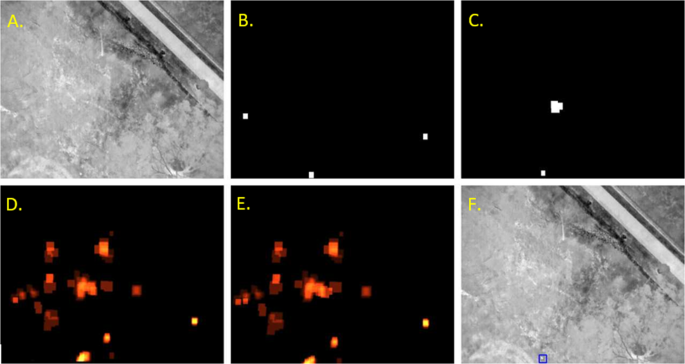 “Automated detection of individual animals in remotely sensed imagery can reduce bias and increase accuracy and precision of wildlife surveys, but few methods have been developed and tested in the field. For mammals, the automated detection methods shown to be most accurate thus far have been applied to thermal imagery, as the large temperature gradient between mammals and their background environment allows computer vision to easily detect and count their thermal signatures. The monitoring and management of koalas (Phascolarctus cinereus), an Australian mammal species of conservation concern, has the potential to benefit greatly from development of a robust automated detection method using RPAS and thermal imagery18,19. Koala populations are often widely and unevenly distributed and frequently occur on private property, making them difficult and time-consuming to survey accurately by direct observation18,20. They are also cryptic in nature and inhabit environments with complex canopy cover, which significantly lowers the probability of detecting all individuals through direct observation both on the ground and in colour photographic imaging. Example detection maps for a single image, and the combined results. (A) Input image, (B) Heat map for the F-RCNN, (C) Heat map for YOLO detectors, (D) the previous accumulator image, (E) updated accumulator incorporating the new heat map, and (F) the detected koala in the original image.